Ivan is an engineer with eight years of experience in software and web development. A short while ago, I was working for a client, integrating video reviews in their website. Like any motivated developer solving a novel problem, the first thing I did was Google it, and I found a plethora of unhelpful or misguided answers on how to achieve something entirely different, or outdated and unmaintained Python packages. Eventually, I bit the bullet and the team and I built everything from scratch: we created the views, learned about Google’s API, created the API client, and eventually succeeded in programmatically uploading videos from Django. 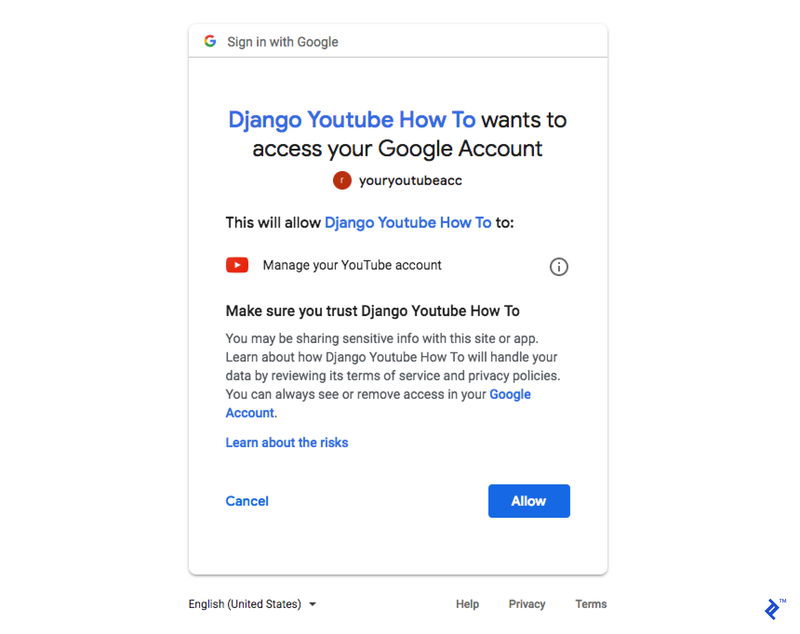 In this post, I’ll try to guide you step by step in how to post YouTube videos from your Django app. This will require a bit of playing around with Google API credentials—first with the web interface, then with the code. The YouTube part itself is very straightforward. We need to understand how Google stuff works because sometimes it’s tricky and the information is spread through many places. After you’ve read the prerequisites, it’s time to get started. Let’s see what we need. Basically, let’s create a virtual environment. I personally prefer pyenv. Setting up both is out of the scope of this post, so I’m going to post some pyenv commands below and, if your preference is virtualenv, feel free to replace the commands accordingly. I’m going to use Python 3.7 and Django 2.1 in this post. ➜  ~/projects/django-youtube $ django-admin startproject django_youtube . 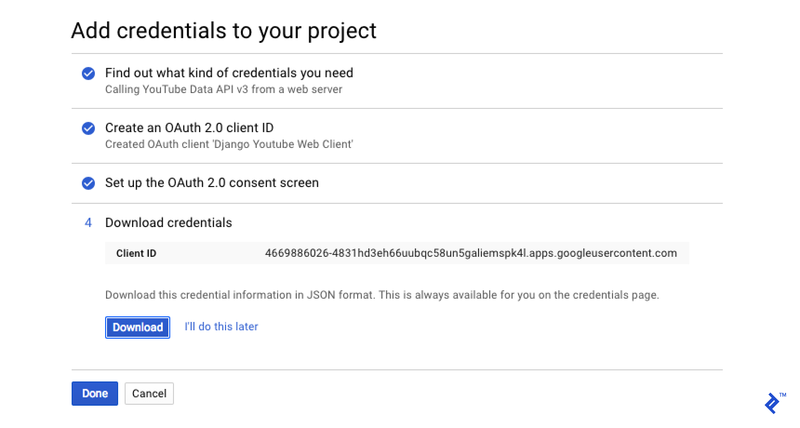 Let’s config our project credentials now so we are able to use the Google APIs. Step 2. Create a new project. Step 5. You should get a message about credentials. OK we are done with our credentials set up. You can either download the credentials in a JSON format or copy the Client ID and Client Secret. See there is an empty path pointing to HomePageView. Time to add some code. Let’s do now a simple TemplateView just to see it running. First of all, you have to create a model to store your credentials. You could to through a file, cache system, or any other storage solution, but a database seems reasonable and scalable, and also you can store credentials per users if you want. Before proceeding, an adjustment needs to be made—there is fork of oauth2client that supports Django 2.1 that we have to use. Soon, we’ll have official support, but in the meantime, you can inspect the fork changes. They are very simple. Go to your settings.py and place the Client ID and Client Secret you got from Google in previous steps. 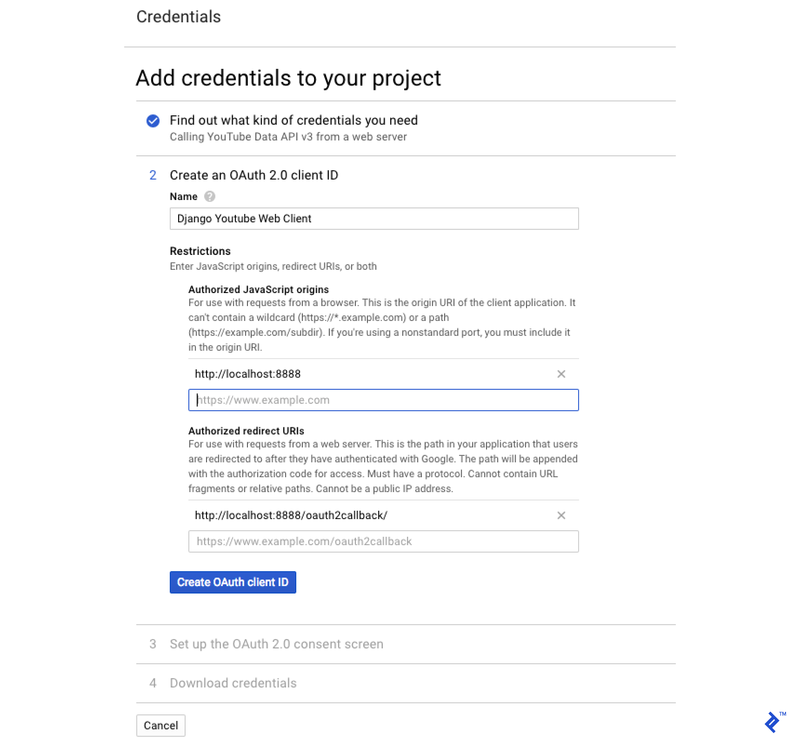 The oauth2client package already provides plenty of functionality, with a CredentialsField already done that we can use. It’s possible to add more fields, like a foreign key and created/modified dates so we get more robust, but let’s stay simple. So if there is no credential or the credential is invalid, generate one and then redirect it to the authorize URL. Otherwise, just go to the homepage so we can upload a video! Let’s create a user then, before going to that page. Let’s also log in with it via /admin. After, let’s access our /authorize/ view again. 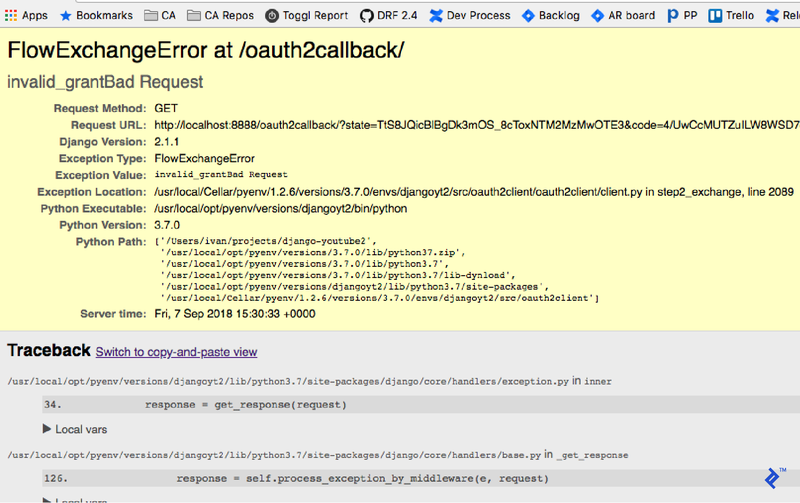 OK, it tried to redirect to the callback URL we configured long ago with Google. Now we need to implement the callback view. Note: The flow was moved to outside of the AuthorizeView, becoming global. Ideally, you should create it under the AuthorizeView and save in a cache, then retrieve it in the callback. But that is out of the scope of this post. You can take a look at similar implementations here. The oauth2client package itself provides views but I particularly prefer to implement my custom Oauth view. Now if you try the /authorize/ URL again, the OAuth flow should work. Time to see if this work is worth it and upload our video! The HomePageView will first check for credentials and if it’s all good, we are ready for uploading our video. For authorization, it’s important to require login and extra permissions for the user that will authorize your application to be uploading videos. The flow variable needs to be moved out from being global. It isn’t safe in a production environment. It’s better to cache based on the user ID or session who accessed the first view, for instance. Google only provides a refresh token when you do the first authorization. So after some time, mostly one hour, your token will expire and if you didn’t interact with their API you will start receiving invalid_grant responses. Reauthorizing the same user who already authorized a client will not guarantee your refresh token. You have to revoke the application in your Google Accounts page and then do the authorization process again. In some cases, you might need to run a task to keep refreshing the token. We need to require login in our view since we are using a user credential directly related to the request. Uploading takes a lot of time, and doing it in your main application process can cause the entire application to block while the upload happens. The right way would be to move it into its own process and handle uploads asynchronously. Confused? Don’t be, read more in Orchestrating a Background Job Workflow in Celery for Python. What is Django and why it is used? From the official website: “Django is a high-level Python Web framework that encourages rapid development and clean, pragmatic design”. It’s the most biggest Python Web Framework and it’s widely used because it offers tools for fast web development, including templating, database handling and security. Is Django a good framework? Definitely. It’s the most popular and is one of the top frameworks. Django takes care of most of the common web tasks so you can focus on your application. If you give three choice options for a Python developer when starting a web project, Django will certainly be one. What is the YouTube Data API? It’s an API provided by Google to include all kinds of YouTube functionality to a given site. This includes uploading of videos, management of playlists and subscriptions, handling of channel settings, search, and others. The very first step would be to go here (https://developers.google.com/youtube/v3/), but that will direct you to the Google Developers Console (https://console.developers.google.com/). There you can search for Youtube API and then add it. Some Google APIs are free, others are not. 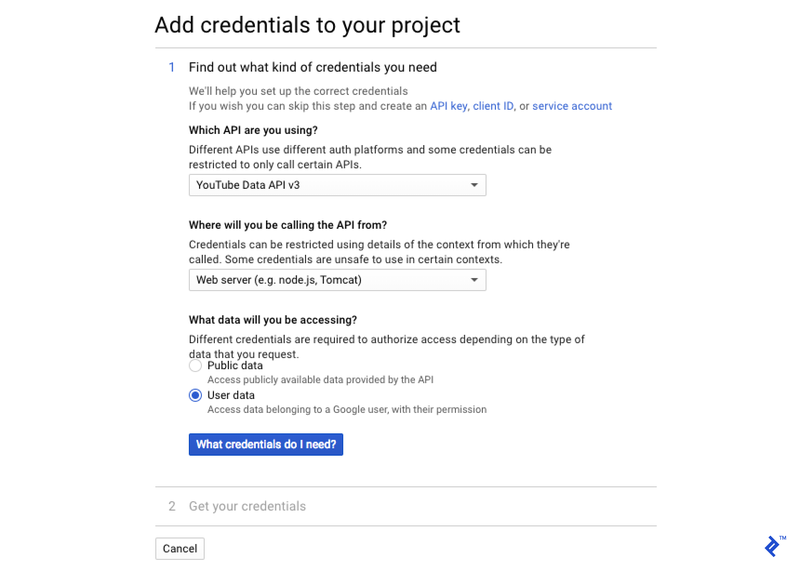 The Youtube Data API, for instance, is free. What versions of Python and Django do I need? In order to follow this post strictly, you need Python 3.7 and Django 2.1, but this should work with Python 2.7, 3.4, 3.5, 3.6 and Django 1.1, and 2.0 as well. Is any setup needed on YouTube side? You need a YouTube account and at least one channel. 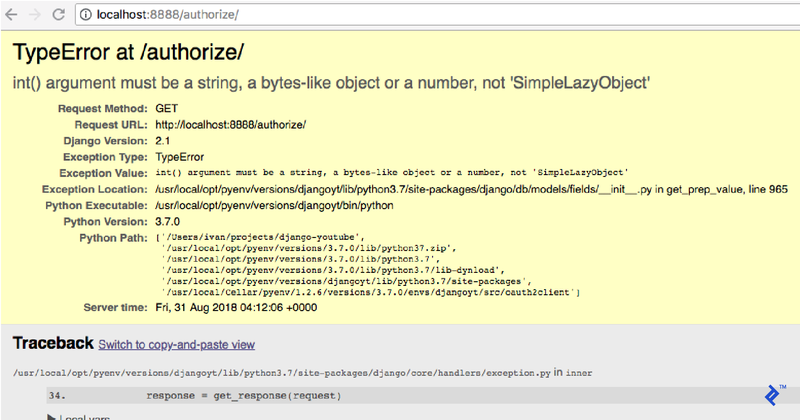 Nice one, please also write about rest api with django. Thanks for the great post. Do you know how to query youtube data api with requests library ?